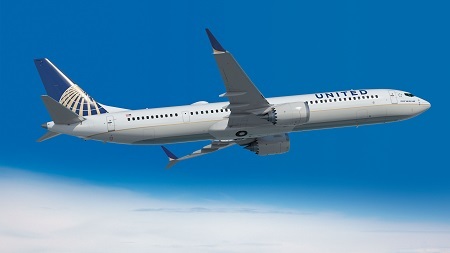 Boeing [NYSE: BA] and United Airlines [NYSE: UAL] today announced an agreement at the 2017 Paris Air Show to convert 100 of its current 737 MAX orders into 737 MAX 10s, becoming the largest single 737 MAX 10 customer in the world. United also announced an order for four additional 777-300ER aircraft. LE BOURGET, France, June 20, 2017 /PRNewswire/ -- Boeing [NYSE: BA] and United Airlines [NYSE: UAL] today announced an agreement at the 2017 Paris Air Show to convert 100 of its current 737 MAX orders into 737 MAX 10s, becoming the largest single 737 MAX 10 customer in the world. United also announced an order for four additional 777-300ER aircraft. "The 737 MAX 10 will enable us to continue using larger and more efficient aircraft within our domestic network and better meet the needs of our customers today and into the future," said Andrew Levy, United Airlines executive vice president and chief financial officer. "The addition of this advanced aircraft to our fleet will enable us to continue to offer the state-of-the-art flying experience our customers expect when traveling with us," said Gerry Laderman, United Airlines senior vice president of finance, procurement and treasurer. United expects to begin taking delivery of the 737 MAX 10 in late 2020. United has flown nearly every version of the 737 that Boeing has produced. The new 737 MAX 10 will add to that legacy, providing United with another in a long line of highly successful aircraft. "We're excited that our long partnership with United will extend far into the future," said Boeing Commercial Airplanes President and CEO Kevin McAllister. "The 737 MAX 10 will provide even more flexibility to United's route schedule and will bring to their operation the best economics of any airplane in the single-aisle segment. We're proud that United's 777-300ER fleet continues to grow." United has now ordered a total of 18 777-300ERs and began taking delivery of the aircraft last year. The 777-300ERs feature the airline's all-new United Polaris business class, featuring custom-designed, exclusive-to-United seats, an elevated dining experience, new custom bedding from Saks Fifth Avenue and new amenity kits. Like all of Boeing's 737 MAX models, the MAX 10 incorporates the latest technology CFM International LEAP-1B engines, Advanced Technology winglets, the Boeing Sky Interior, large flight deck displays, and other improvements to deliver superior efficiency, reliability and passenger comfort in the single-aisle market.